Okay, so I didn't lose the 5 pounds expected during the cleanse. But I did have a busy week with unusually late dinners. I also can't remember the last time I lost almost 2 pounds in a matter of days and wasn't feeling crappy (tired, bloated, achy, sneezy, dry itchy eyes, etc). In fact, I'm feeling pretty good! 16 ounces of water with a splash of lemon juice with supplements (liver detox, MSM and probiotic). Breakfast: 1 cup of Flaxseed Granola with choice of 1/2 cup blueberries, 1/2 pear or 1/2 apple served with Silk Coconut Milk. I chose to have blueberries this morning only because I needed to use them up. I didn't want them sitting in my fridge going bad. As usual, served with unsweetened Silk Coconut Milk and topped with some dried cranberries and extra cinnamon. 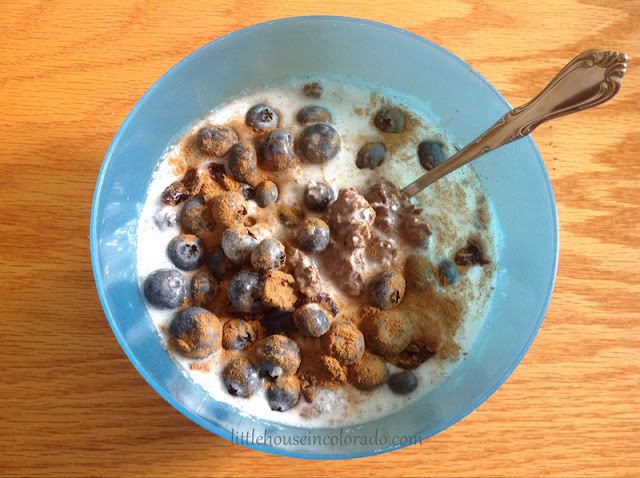 Flaxseed Granola with choice of 1/2 cup blueberries served with Silk Coconut Milk and topped with dried cranberries and cinnamon. 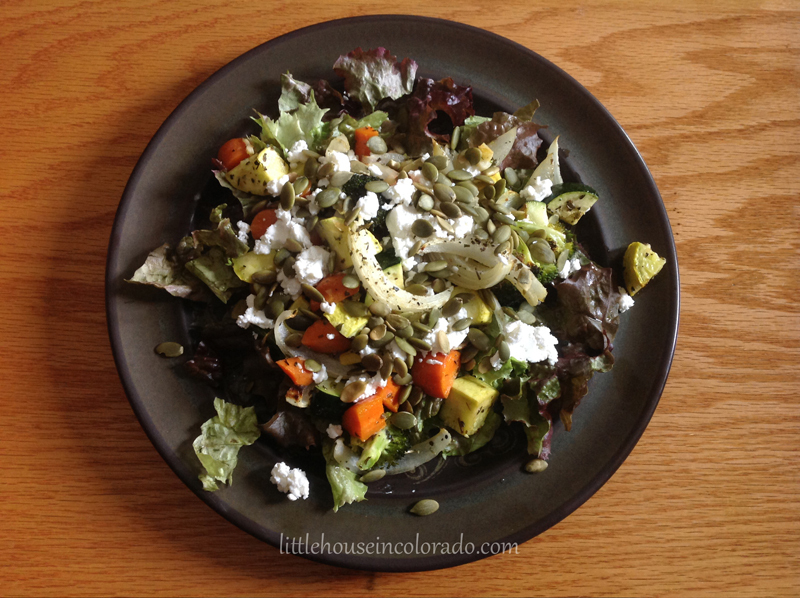 Lunch: Leftover Roasted Vegetables reheated and served over a bed of Red Leaf Lettuce, topped with Raw Pumpkin Seeds and 1/2 ounce hard or soft Goat Cheese. This lunch was SO satisfying! The roasted vegetables were hot so the goat cheese began to melt over them. I topped it all the some extra virgin olive oil and lemon juice. This was definitely something I could eat on a regular basis! 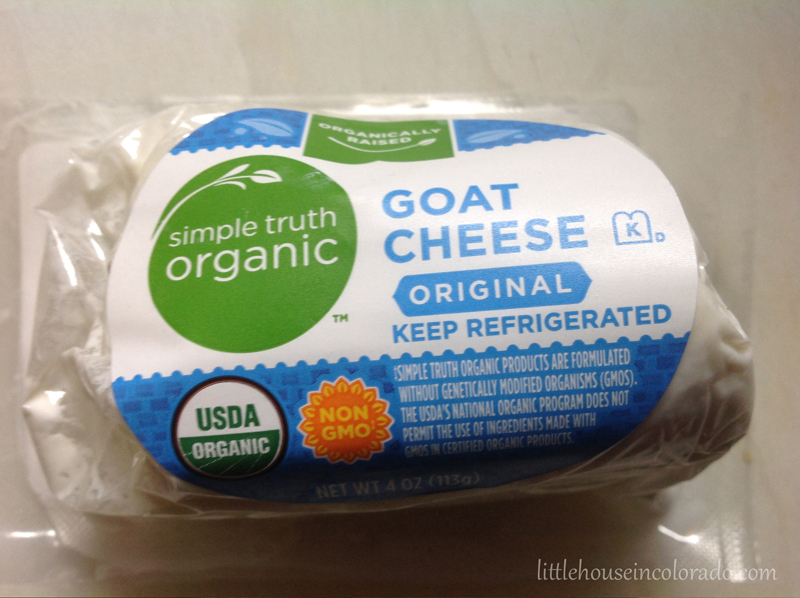 I used Simple Truth brand soft goat cheese. This is a Kroger organic brand which I find in the deli section of my King Soopers grocery store here in Colorado. It was the least expensive available at $4.99 on sale. I also purchased some hard goat cheese to try if the soft cheese didn't agree with me. I cut 2 Carrots into sticks and spooned out 2 Tablespoons full of Raw Almond Butter. I had heard some people reacted to unblanched almonds but passed blanched almonds. 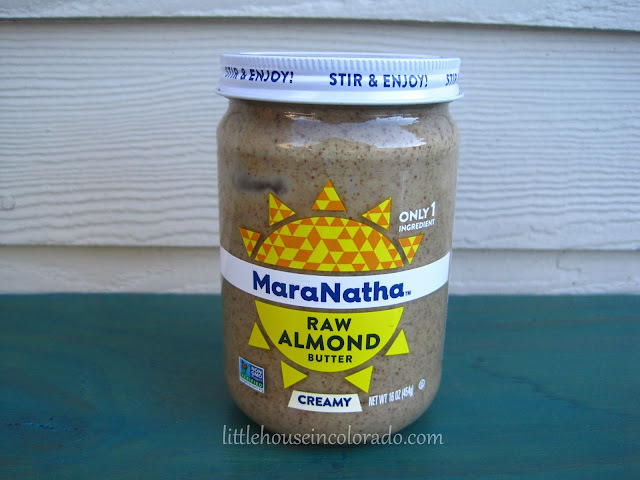 Finding almond butter that is unsalted, raw AND made with only BLANCHED almonds was quite a task. Trader Joes is apparently the only maker of this combination and since the closest one is 30 miles away, I would be better off making my own almond butter. BUT...before purchasing almond butter, I decided to first see the results from the Day 2 almond test. 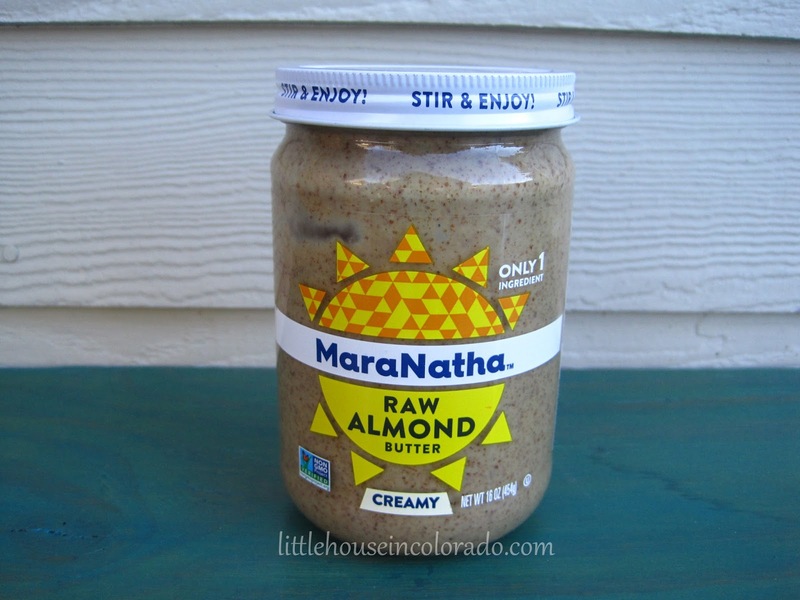 I ate UNblanched almonds and passed so I went to the grocery store and purchased MaraNatha Raw Almond Butter made with UNblanched almonds. 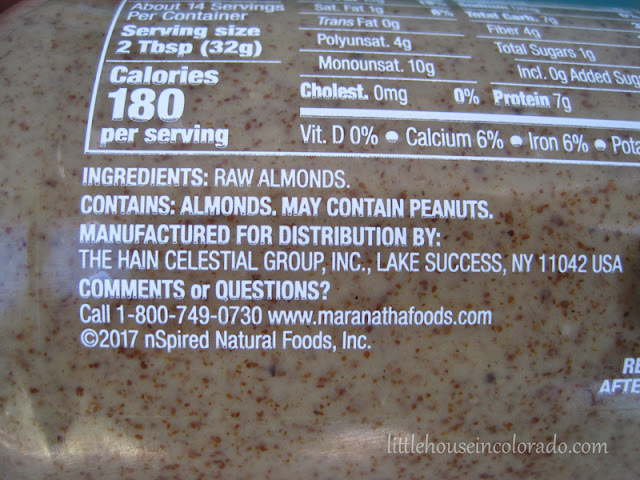 One ingredient...Raw Almonds. No salt. No palm oil. No nothing. Well...all that trouble over almond butter was for naught. Within minutes of finishing my snack, I started feeling like I had heartburn. I developed a severe headache, started sneezing, had stomach pains and my eyes became dry and itchy. Here I was on Day 4 testing cheese and the almond butter got me. 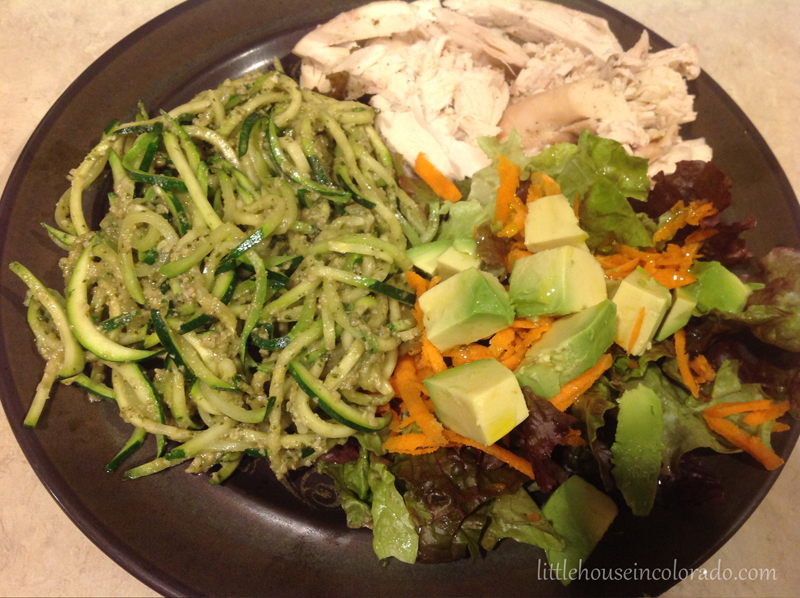 Dinner: Roasted Chicken, Zucchini Noodles with Sunflower Pesto and Red Leaf Lettuce with Carrots and 1/4 Avocado. Knowing there was a good chance I wasn't going to pass the day because of the almond butter, I almost caved in for dinner. It was Saturday...our regular Pizza night when Mr. LH takes over and makes pizza for everyone. He had been doing it for YEARS. It smelled SO GOOD when he was making it! But...I was good and stuck with The Plan. I didn't plan ahead and forgot to soak the sunflower seeds overnight for the pesto. They soaked for only about 30 minutes. I used an OXO spiralizer for the zucchini noodles. If I had to make this often for the entire family, a hand crank spiralizer would be helpful but I really don't want or need another large gadget taking up space in the kitchen. The OXO is a small size and can tuck away in a drawer. The chicken was leftover from the roasted chicken the night before and I had olive oil and lemon juice on my lettuce, carrots and avocado. It wasn't pizza, but it was very filling. The sunflower pesto was pretty good! I froze the extra in an ice cube try so I could pull out small portion sizes when I needed it later. Roasted Chicken, Zucchini Noodles with Sunflower Pesto and Red Leaf Lettuce with Carrots and 1/4 Avocado.